The only occupants of a three-bedroomed family home in Brighton are the foxes in the overgrown, rubble-strewn garden. The city council, which has 13,372 people on its housing waiting list, said the two-storey Victorian house has been empty since 1979 - the year Margaret Thatcher became prime minister. Neighbours are frustrated at the state of 87 Chester Terrace and even the leader of the city council has said he is angry. Yet numerous attempts by the council to force the owner, Derek Burns, to sell or improve it have failed. "Seeing and living next to the derelict property is a constant reminder about the huge shame that it is empty," said neighbour Julia Powell. "There is also the waste of public resources and the huge amount of effort and energy that has been put into trying to get the owners to reoccupy it." Chester Terrace is one of 933 homes in Brighton and Hove which have been empty for more than six months, according to the Empty Homes Agency, which campaigns to bring empty properties back into use. 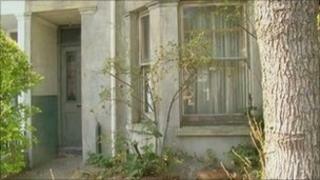 Across Sussex, 5,500 homes are standing empty. "The real scandal is not just this house but that we have actually got 300,000 other homes like this across England," said David Ireland, chief executive of the Empty Homes Agency. "At a time when house building is at its lowest rate since the 1920s, we have really got to make better use of the houses we have." The council's involvement with 87 Chester Terrace began in 1979 when neighbours began complaining about the state of it. Mr Burns was twice prosecuted over its condition and a Compulsory Purchase Order (CPO) was obtained by the council in 1996 after a public inquiry. Mr Burns told the inquiry the house had been in his family since it was built in the 1860s and that he was born there. There is no other way we can do it. We can't simply turf the man out of his house. He claimed he lived in it on and off until 1983 when he had to leave because conditions were harming his health. But the council never enacted the CPO, instead agreeing to give Mr Burns a grant of £55,000 to carry out refurbishments. The work was never completed and the council is now attempting to obtain another CPO. Mr Burns was asked by BBC South East to put his side of the case but declined. His only comment was: "Talk to the council." City council leader, the Green Party's Bill Randall, a former chair of Shelter's National Housing Aid Trust, said he was angry the house was still empty. "It is not good for a house like this to be left empty this long," he said. "It has been empty for a variety of reasons. "One, the procedure for bringing it back into use is difficult. "Two, there have been a lot of broken promises from Mr Burns. "Three, I don't think previous councils have shown the political will to deal with this. "We are looking at it again and there is a public inquiry coming up - we hope - into the compulsory purchase. "This isn't a procedure we invented. There is no other way we can do it. We can't simply turf the man out of his house. "But this house being empty for this length of time is an insult to every homeless and badly-housed family in Brighton and Hove."